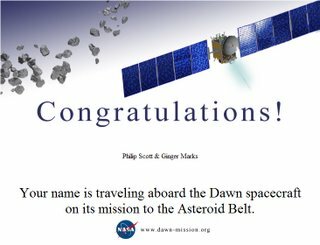 For those that don’t know, NASA is sending the Dawn spacecraft on a mission to the Asteroid Belt. On that spacecraft are the names of a select few humanoid life forms that stay tuned to the NASA missions. If you would like to be included click here and simply enter your name. Once you have done that be sure to print or save your certificate for posterity. You see, I paid close attention to this mission due to the fact that my mother’s name is DAWN. I can tell you for sure that Dawn will be on board Dawn flying through outer space, along with my hubby and me, and my twin sister. Now I want to invite you to join us too before it is too late. Get your name on board the Dawn Spacecraft and soar through the heavens with us.